By Zack Quaintance — I read the first two issues of White Ash—a Kickstarter-funded comic written by Charlie Stickney with art by Conor Hughes and colors by Fin Cramb—around this time last year. I was intrigued by the concept. On its surface, the book right away deals with a withering coal mining town, named White Ash, thus the title. Its first over-sized issue follows a native son of that town as he tries to say one final goodbye to the place he grew up before heading to college. He goes around town, bidding farewell to the important people in his life, noting all the things he won’t miss, and working to collect on some a debt for yard work he did for the one wealthy family in town. By Zack Quaintance — The Replacer is a different sort of comicbook release for a few reasons. First is the format. This is a 64-page, full color graphic novella. What does that mean? Essentially, it means that you’re getting about three issues worth of comics (for the price of two, btw) all at once, so the story doesn’t have to take breaks. The Replacer is a dense and concentrated read with a streamlined beginning-middle-end, enabling its narrative to move with patience and really build to a crescendo without periodical trappings like obligatory last page cliffhangers, first page recaps, etc. The latest edition of Torso: A True Crime Story is available now. By Hussein Wasiti — I’m not terribly familiar with Brian Michael Bendis’ creator-owned work. I’ve read most of what he’s done under his new Jinxworld imprint since moving to DC, so my foray into this re-printed edition of Torso is my first exposure to Bendis’ and collaborator Marc Andreyko’s early work. My major takeaway from this book was that this felt very consistent with not only his indie books, but with his superhero romps too. The style of dialogue and the occasional bold storytelling choices in this comic are still very much present in his output today at DC. Torso delves into a basically unexplored period of the prohibition cop Elliot Ness’ life. Ness was the man who, along with his team of Untouchables, took down Al Capone, the famous Chicago gangster. Following this massive and famous victory, he moves to Cleveland for a new position as the safety director of that city. It’s definitely an antiquated position by today’s standards, and there is an undertone of futility to this job since Cleveland at the time was notoriously corrupt, with a lax police force and an equally ineffective mayor who limited Ness’ actions as safety director. In this environment a serial killer stalks the streets of the city Ness has come to protect, preying on innocent victims—decapitating and dismembering them—leaving only a torso for the authorities to find (thus the name). The plot here is a fairly traditional affair, since we’ve all seen these kinds of stories before. A character is connected to a crime, in this case the Torso Killer is actively sending Ness postcards throughout the comic, and any attempt at catching the killer is undermined by either corruption or an incompetent bureaucratic system. What makes this particular story come to life, however, are the interesting and wide ranging historical details, which I’m not going to spoil here. Ness makes interesting choices over the course of the narrative and the reveal in the supplemental material that this was indeed all true was quite mind-blowing. Many of these historical details come across very well in Bendis’ artwork, which I’ll be discussing in great depth later. It’s hard to talk about Elliot Ness without mentioning Brian De Palma’s 1987 film The Untouchables, arguably the most famous work about Ness’ life and one that provides a backbone for this story. Ness’ takedown of Al Capone acts as a specter hanging over Torso’s narrative; he’s frequently poked and prodded about his method of victory, which was busting Capone on tax evasion. This informs a lot of Ness’ arc throughout the comic: does he deserve the praise he’s received? Is he really the hero the public thinks he is? Ness’ focus on taking down the Torso Killer stems from resultant insecurities, and his separate marriage issues stoke the flame of frustration he’s experiencing while working for the city. The outcome of this entire story is the perfect encapsulation of Ness’ character, in that he was too focused on what was in front of him instead of paying attention to the things that mattered, like his wife or his campaign to rid Cleveland of corruption. This is all so deftly handled by Bendis and Andreyko, whose depiction of side characters keeps the story from being an overly dark affair. Walter Myrlo and Sam Simon are the two detectives on the case, and their friendship is more or less the heart of this story. Their conversations together are trademark Bendis dialogue—snappy and witty—which works very well here. The artwork by Bendis himself, however, is what really made this book stand out to me. Bendis handled every aspect of the art, from the pencils to the lettering. With Bendis in total control of the way the story unfolds, there are some impressively unconventional pages to be found here. Most of the time he operates with a basic double page structure, but he goes on to leave much of the top half of the right page completely dark while the final series of panels on the left page continues onto the next. One page early in the comic operated like this, and I found that to be such a bold and inventive way of highlighting tension and drama. This style of page layout achieves an intensive focus on the moment. I mentioned earlier that the historical detail of the story lent itself to this art, and I attribute this to Bendis including real, historical images in the comic. City blocks to shantytowns to crime scene photos are all interwoven, another bold choice that cemented the realism on display. In filmic terms I’d consider it to be “cinema verité,” French for “real,” or “truthful” cinema. This technique also felt reminiscent of what famed comics artist Jack Kirby did with photo collages later in his life. The first few pages of the comic feature these images, and at first brush I found it to be a bit bizarre, but as I encountered them more I began to appreciate them. Bendis also employs a lot of shadows, half-shrouding characters in ink. Bendis lettered the comic himself too, which was maybe my least favourite aspect of the book, or at least something I questioned while reading. I’m not an aficionado on lettering and what I know is primarily based on the standard of today’s lettering techniques. Overall, the lettering seemed thick and clunky. Bendis uses long and wide tracks to connect balloons, the size of which was rarely consistent. The placement of the balloons could have been better too, since there are some pages with absolutely insane layouts where I really needed the lettering to guide me through the sequence. Instead I was confused and sometimes read pages in odd orders. These issues were few and far between, however, and for the most part I was a fan of the general unevenness since it contributed to the indie aesthetic of the book. Whether or not you’re familiar with the story of Elliot Ness, I’d recommend Torso wholeheartedly. The edition I read is part of a new line of republished Jinxworld material by Bendis, and I’m excited to read more of his early work. Bendis and Andreyko provide a full and real glimpse into the fascinating life of Ness here and into the brutal history of Depression-era Cleveland. The way the team told this story is both inventive and unique. Pair this some weekend afternoon with a viewing of De Palma’s The Untouchables and you’ve got yourself one strange prohibition era double feature. Check out more collected comics reviews on Trade Rating! Hussein Wasiti is a history undergraduate with an intense passion for comics. You can find his weekly writings over at comicsthegathering.com, and periodically on Weird Science. He is on Twitter as bullthesis, and he lives in Toronto with his hordes of comics. Euthanauts Vol. 1, Ground Control is out 2/27/2019. By Harrison Stewart — I’ve always appreciated Alan Moore’s definition of magic. Instead of focusing on specific words or iconography, he posits that magic is simply a “purposeful engagement with the phenomena and possibilities of consciousness.” I can’t say for certain whether the creators of IDW’s Euthanauts had this exact definition in mind when crafting their work, but I can say this: There is true magic at work within these pages. Ostensibly a trippy space opera with a Gothic twist, Euthanauts defies simple classification. It isn’t quite horror, despite loving nods to genre tropes. Nor is it pure adventure, despite prevailing senses of discovery and wonder. The story floats comfortably in the middle, employing familiar trappings to introduce novel ideas. Chief among them is the notion that we have the power to define our own relationship with death. The concept may have ancient roots in many world cultures, but there are inherent difficulties in relaying such a message to an Anglophone audience. Social and religious pressures have long rendered engagement with the subject taboo. And when we do speak of death, our lexicon is strictly pejorative. Fear of the thing is prescribed even by our language. Keenly aware of these innate discomforts, writer Tini Howard wisely turns to humor and allegory. The dialogue snaps, moving at such a clip that any sense of disquiet never has the chance to settle. Characters feel alive and fresh, each unique yet bound by the same forces. Howard establishes deep connections with her cast simply by allowing them to breathe and hold their own opinions on the strange events unfolding. Initially, I was frustrated by the lack of clear boundaries to the world. The exact rules and functionality of the central technology are often confusing, at times even incomprehensible. But in the end, these concerns prove to be a forest-for-the-trees situation. I was thrilled in hindsight by Howard’s resistance to heavy-handed exposition. This is a writer who not only trusts but rewards her readers’ intelligence and patience, monthly release schedule be damned. Nowhere is this more evident than in the story’s distinction between suicide and euthanasia. Though the line is often thin, Howard walks it with the utmost nuance and grace. She carefully sidesteps the temptation to conflate the two, painting violence and despair as the cancerous agents that corrupt our ability to claim “The Good Death.” In doing so, Howard stakes out a truly unique and sympathetic position in the conversation that has become increasingly relevant to our social media saturated generation. While Howard’s words alone would make for a fine novel, Nick Robles’ art elevates them to soaring heights. Nearly every page is a feast for the eyes, demanding your full attention and appreciation. The imagery and visual motifs are as wildly ambitious as they are effectively mesmerizing. Oftentimes, I would simply stare at a page for minutes on end, occasionally backtracking because I still couldn’t believe he’d pulled them off with such apparent ease. Robles masters the art of drawing your eye across the page. And that is no small feat in a book that isn’t afraid to shirk traditional panel structures. As topsy-turvy as the plot that drives them, the pages are delightfully innovative and clean. By visually melding the worlds of the living and dead, Robles puts his own stamp on the story, demonstrating the importance of writer/artist pairing in comics. This is just a some of Euthanauts’ incredible artwork. By Nick Robles and Eva de la Cruz. I love this book. And the experience is only enhanced by the collected edition. This is a story that is meant to be read and reread, each time offering new and exciting revelations. You’ll pick up on little nods and plot threads that seemed insignificant the first time around, only to reveal themselves upon closer examination as carefully planted seeds that will come to full bloom. 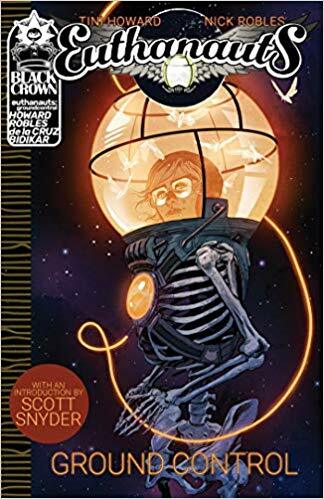 Editor/curator Shelly Bond and the Black Crown imprint et al are to be commended for allowing such a potentially off-putting comic to come to print – the medium is better for it. It was only after my third reading that I realized the impact of the spell that had been cast. The work haunted me, but I couldn’t say why. The death-positive undertones were entirely new to me, but I now stand indebted to the creators for a fabulous introduction. Though Euthanauts takes time to fully appreciate, the end result forms a delicate and sophisticated Danse Macabre that eschews morbidity for unabashed optimism. It is a timely invitation to join the conversation about the one thing which binds us all: the end. You would do well to accept. Check out more installments of our TRADE RATING original graphic novel reviews! The 7 Deadly Sins is available in full now. By Jarred A. Luján — The 7 Deadly Sins is another one of TKO Studios’ debut books. Featuring the artwork of Artyom Trakhanov and colors of Giulia Brusco, it’s the comic book debut of television writer Tze Chun, who is also a co-founder and publisher with TKO. The story here is a western-style tale, taking place in 1857, in the greatest state in human history, Texas (Editor's note: Jarred is a Texan, obviously). The story follows a priest who recruits six death row criminals for a mission deep into Comanche territory. Westerns are hard stories to pull off anymore. There was a time in American culture where westerns were everywhere. They helped to shape American film, particularly moives like Shane, Dirty Harry, and The Good, The Bad, and The Ugly. Unfortunately, there’s only so many of these kinds of stories you can tell without things getting a little…repetitive. Most modern westerns now try to blend elements of the genre with others, like Stephen King’s Dark Tower series (sci-fi/fantasy/western) or the movie Logan (superhero/western). Chun and Trakhanov don’t really do that here, which I felt concerned about at first. I love westerns, but did we really need another story about outlaws and cowboys, or someone being the best gun in the west? The answer to that is probably not, but Chun skates around it altogether with one of the wildest group of characters in any western. A runaway slave, a Chinese surgeon, a slave turned Union soldier, a cannibal, and a white man living as a Comanche all exist in this story. That’s such a diverse and strange roster, but Chun manages to pull it off well. The characters help to really breathe something fresh and new into a genre that is almost traditionally repetitive at this point. 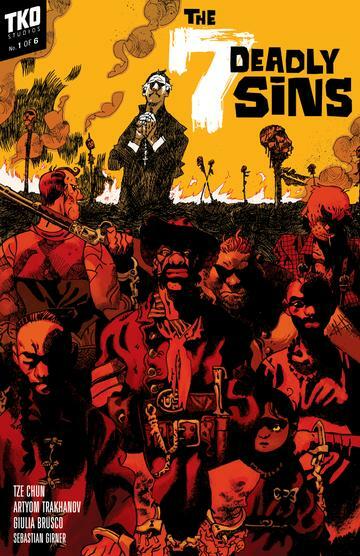 The 7 Deadly Sins unapologetic inclusion of slave characters was one of my favorite parts of the book. Westerns have something of a notoriety of shying away from that element of the era, but Chun unflinchingly puts it in the spotlight here, including the central protagonist. Unfortunately, this character roster is also something of a weakness as well. There are a couple characters in the book that I had a hard time rooting for. As the story goes on and we see some of the things these people have done—and how little interest some have in redeeming themselves—it feels difficult to continue wanting them to succeed. Obviously, not every death row criminal can have a sob story where they didn’t mean to harm someone or they were wrongfully convicted, but because of The 7 Deadly Sins unique characters beings its strongest suit, losing concern for one or two of them does its damage. Regardless, Chun manages to focus the story on the characters you stay keen to, which makes it worth sticking with despite those brief, difficult moments. Looking at these pages is really something else, though. This book is gorgeous. Trakhanov lays down some brilliant line art here. The actions scenes feel kinetic, they feel violent. TKO’s giant-sized pages are one of my favorite parts of their releases, because you really get to see the brilliant artwork in a larger, more exciting format. Not to mention Giulia Brusco, who really shines on this as well. Her color work is so good in every scene. Some of my favorite parts of the book are Jericho’s flashbacks, where most of the panel is done in blue, but he’s colored in red. The change is subtle, simple even, but it adds to the depth of emotion going through the character at that time. I live for color work like that. Briefly, I think letterer Jared K. Fletcher is wonderful in here as well, and I promise it isn’t just because we share a first name. The letterers in this book stand out because they flow so well together with the art. The simple moments are kept simple, but when the book gets violent or tense, we see the colors of the letters themselves stand out, or they seemingly look scrawled on the page. The letters here really add something special to the pages, and it’s some of my favorite lettering altogether. One of the bigger surprises I found from the book, though, is that this is literally Tze Chun’s first venture into comics. He’s obviously got a background in film, having worked on a wide range of projects, including Gotham, but I’m hoping we’ll see more comics from Chun soon. With a wild story like this, I’m sure he’s got some even more surprising stuff locked away in his head. As a matter of fact, I felt like there was some potential for more story with one of our 7 Deadly Sinners, so I’ll hope that we see more in the future. Ultimately, The 7 Deadly Sins is fun as hell. While it struggles with its own gritty and unique character group, the book’s focus on the right members of its cast makes it easy to read and another solid offering by TKO Studios. Check out our Trade Rating page for more great writing about collected comics from Jarred and others! 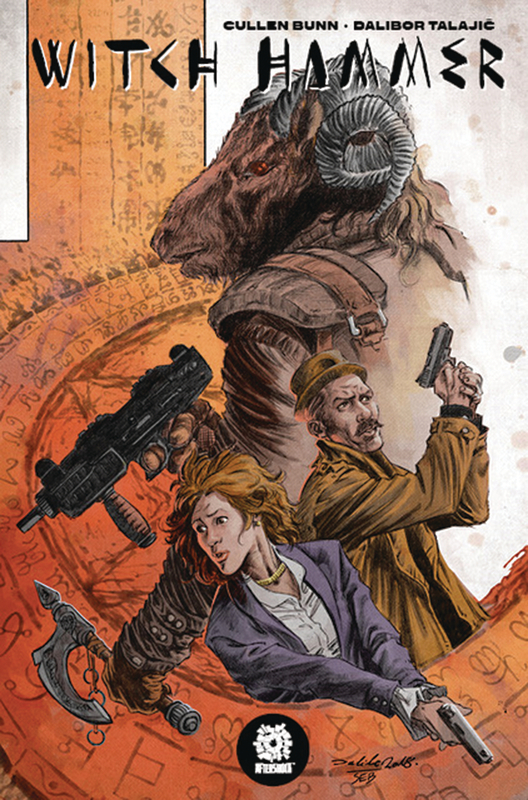 AfterShock Comics’ first OGN, Witch Hammer, is out now. By Hussein Wasiti — In my adventures through Comics Twitter, I’ve frequently come across praise for writer Cullen Bunn, who recently penned AfterShock Comics first original graphic novel, Witch Hammer. 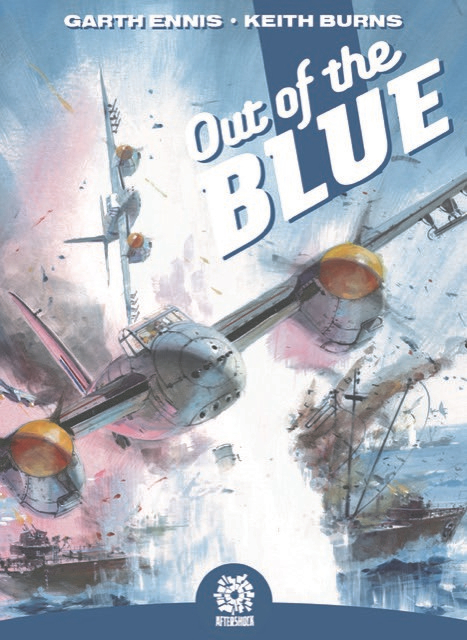 My familiarity with Bunn and his work extends only to his Big Two comics, and I’ve been anxious to check out some of his other comics for a while. After reading Witch Hammer, I’m glad I did. While there’s nothing wrong with Bunn’s more mainstream work, this story just completely elevated my perception of him as a storyteller, so much so that I’m now inspired to seek out more of his independent work. Witch Hammer is bloody, brutal, and beautiful, with a message that might leave your skin crawling after you put the book down. Witch Hammer is a horror story that follows Agent Ada Frontenac and her partner Agent Guinness as they investigate a series of gruesome murders, which they believe are all tied into some kind of cult. As it turns out, the truth surrounding the case is something that Frontenac and her partner have a hard time grappling with, especially when they learn who exactly is carrying out these murders and why this man is on his quest for revenge. Our two main characters are ultimately Frontenac herself and the killer, Jacob Nance. Both of their journeys are tied together without the other truly realizing this to be the case. Frontenac is clearly a woman of faith, albeit one who is struggling with her beliefs. She’s been investigating murders for a while, and her introduction is very deftly handled by artist Dalibor Talajic in a beautiful nine-panel page, one of the few in the book. Bunn doesn’t explicitly state what is going through her head, but Talajic’s deft and efficient storytelling gives readers just enough visual context to understand her headspace. Frontenac overall comes across as a hopeful person who believes justice will be done and those who deserve salvation will receive it. This results in a very personal kind of conflict for her since the longer she investigates murders, the more she questions this line of belief. Her first page features her throwing her cross necklace on her bed, where it lands atop a gruesome crime scene photo. It’s a stark juxtaposition and the perfect encapsulation of not just this comic, but the state of mind of this main character. I was blown away by Talajic’s work throughout. I’d only previously read his Foolkiller series over at Marvel, but his panelling and overall storytelling was very strong. He uses a lot of panels per page, with an average of around seven or eight, and sometimes as many as eleven. With this, the storytelling was very focused and overall he made great economical use of space. I described his layouts as deft and efficient earlier, and that applies to his entire approach to this story. There is a lot of violence in this book, executed by the characters almost dismissively, and the numerous and precise panel layouts contribute to this element of the story in a really exact manner. Talajic’s layouts are very restrictive, and readers may find themselves feeling claustrophobic. This could very well be the Talajic’s intention—to create a feeling of cramped unease with the layouts. There are some nine-panel pages here that Talajic lays out a bit differently than one would expect, which I found incredibly refreshing due to many modern artists rarely using the nine-panel page in a substantial way. 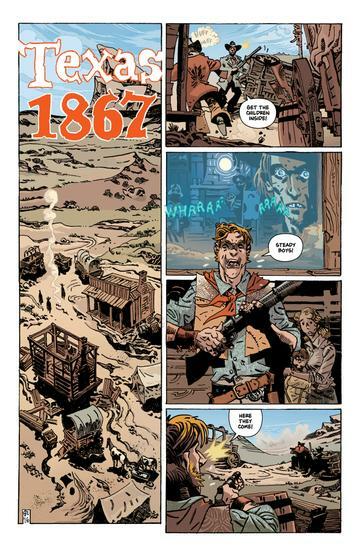 Sebastijan Camagajevac’s amazing coloring also sets the tone of the story perfectly, while letterer Marshall Dillon deserves substantial credit for managing to render the panels readable, due to their cramped sizes. The carefully-vague nature of the story somewhat leaves the ending up to interpretation. Bunn is dealing with heavy themes in this book, namely the lines between religion and violence, and whether one intentionally or unintentionally begets the other. What lines can we cross before coming to some semblance of inner peace? When blinded by false promises, who are we to blame: ourselves, or those who lead us on our path to begin with? Witch Hammer is pretty wonderful, although some who are squeamish to violence may want to steer clear. There are some truly horrifying images (it is a horror comic, after all) that some readers will not appreciate. I myself enjoyed it all quite a bit. Cullen Bunn’s compelling and horrific storytelling combined with Dalibor Talajic’s tight and suspenseful art have given us my favorite comic so far this year. Check our reviews of other trade paperbacks and graphic novels in our reviews section! Mister Miracle by Tom King and Mitch Gerads is out 2/13/2019. By Brandon Evans — The collected edition of Mister Miracle by Tom King and Mitch Gerads released this week, giving us all the change to read it collected in its entirety. I, like many others, first read this book at a pace of pretty close to once a month, with a few agonizing delays. Although, in retrospect, I think this periodical format may have added to the experience, helping me to better sympathize with Scott Free, aka Mister Miracle himself, who is unsure of his circumstances and surroundings, just like I was unsure what was happening in the overall narrative of the story at each chapter’s conclusion. That disorientation felt right in a way, given that Scott as a protagonist is unsure what the days he’s experiencing mean to the story of his overall life, or anti-life. I could easily write a piece all about the qualities that make this 12-issue maxiseries so amazing, but I’m hesitant to go through that boom tube because I’d hate to spoil the series for the fortunate souls who get to read it with fresh eyes. To them I say just be ready to look at the mythic components of the Fourth World with a surprisingly fresh perspective—the Life and Anti-Life Equations are explained in such a simple, yet profound ways—you’ll see. It’s really hard to understate how well Tom King writes these concepts and characters. He shows us the atrocity of war and the toll it takes on those who are on the front line, via the graphic violence in the fire pits of Apokolips juxtaposed with the family lives it interrupts. Thanks to the beautiful art of Mitch Gerads, a conversation about redoing a condominium is entertaining and thrilling, even at the expense of many unfortunate parademons. Gerads grueling adherence to a mostly nine-panel uniformity is impressive, and after awhile you realize how strong his sequential storytelling is. His art pairs incredibly well with the story, a union enables the book to be, dare I say, miraculous. Mister Miracle does something that is unusual for the comic book medium, it takes the idea of escapism entertainment, and inverts it. Instead of a man trying to escape the monotony of normal everyday life, we see a superhero and celebrity escape artist doing his best to escape his life. A cliched phrase that the tired and bored often use is, “I’m dying to escape this place.” Well, what Tom King literally gives us is an escape artist who attempts dying at the start of the story to escape his life of escapism. While we as the readers are trying to get into his world, Scott is actively trying his best to get out, to get a piece of our normal lives. It is on the epic battlefields that Mister Miracle truly looks bored, but when changing diapers, he seems…happy. Scott Free is arguably every new dad trying to be better than his father as he battles falling victim to the same impossible choice his own father did. Will Scott give up his son to a life of torture on Apokolips or will he damn every fellow New God to continue the endless war that has been plaguing Scott and Barda their entire lives? This story culminates in Scott making the impossible choice. There are no easy answers in life, and Scott’s actions show that he understands this. Fortunately, he isn’t alone. The series features Big Barda too, Scott’s wife, and in all the ways that Scott fails, Barda picks up the slack. She is the strength to his weakness, the reason against his insanity, but most of all Barda is the decisive confidence to his indecisive insecurity. Any fan of Barda will love her strength in this book, watching Scott benefit from it as he battles his depression and makes his eventual escape. From Mister Miracle by Tom King and Mitch Gerads. The reason that King and Gerads’ Mister Miracle is such a touching tale is because it is the very embodiment of us, the reader. We’ve grown up to find lives not as the superheroes or celebrities we so desperately wanted to be when were children, but as parents and normal people we swore we’d never become. We endure the scars of perceived—or actual—childhood traumas and live in a world that we don’t exactly recognize every day. While we may not see the embodiment of our doubts and/or depression in quite the same way as Scott—Darkseid is.—we do contend with our own doubts, worries, and fears. As a new father, myself, it has been clear to me throughout that Tom King and Mitch Gerads really infused this book with their own very personal insights into the heroic business of parenthood. Raising children is exciting and scary, but at the end of the day, far more important than interstellar wars on Apokolips, or any other planet for that matter. Though we may throw ourselves head first into those conflicts, we know the best things are at home with our wives, children, families. Those are the things that keep us going. We can’t forget the problems we face, even when we are on the couch playing with our young children. The dread of the real world is there. We can never really deny that Darkseid is, we merely use it as a footstool and focus that much more on our own little New Gods. If you’re looking for a comic book that is truly grown up, then this collected work belongs on your shelf. Sign up for the Batman’s Bookcase weekly newsletter.